This independent transport videos programme features London’s articulated buses through their short history on the streets of the capital. We open with a moving montage of these buses around the West End and in other areas during the period when they were seen alongside the traditional Routemasters on the other routes that they gradually replaced. This was during 2004/05 and features many well-known London landmarks. Our cameras returned in 2009 and comprehensively caught the fleet of Mercedes Benz Citaros in service around central London. We start our filming at one of the main hubs where four routes using these vehicles meet, namely Victoria. After a ride on MAL37 (BD52 LNO) to Waterloo we catch more in action in that area. We cross the river and dive through the Kingsway Subway on board MAL20 (BX02 YZD) towards Holborn. Here three routes using these buses pass our cameras before we head towards Tottenham Court Road, Oxford Street and Oxford Circus and westwards to Marble Arch. We continue to the centre of the West End at Piccadilly Circus and follow two routes through to Trafalgar Square, Whitehall and Parliament Square before returning to Victoria to capture arrivals and departures during the evening rush. 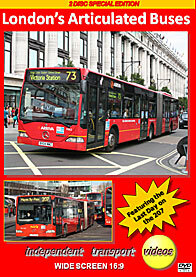 Part two on disc two features the last route to use these buses, the 207 from Shepherds Bush to Hayes By-Pass. We spend the last day following and riding the articulated buses along the Uxbridge Road, filming in Shepherds Bush, Acton, Ealing, Hanwell and at the terminus at Hayes By-Pass. This last day was Friday 9th December 2011 and after a ride on EA11058 (LK05 FCZ) and EA11084 (LX03 HDH) our final shots feature some of these buses in Southall and Ealing at night with the bright lights of the local shops providing the backdrop. Enjoy the journey on these modern buses which in London are now no more. Duration : 155 minutes (approx).